The End of White House Press Briefings? White House press briefings are at their shortest in decades, sometimes only 15 minutes, if they happen on camera at all. White House press secretary Sean Spicer and deputy Sarah Huckabee Sanders often deflect answers or answer defensively. White House Press Pool reporters – and their reading public – are increasingly left without access and answers to the Trump Administration. Should we toll the death knell for the briefing?For news, analysis, history & legal background read on. An ABC News analysis Found that Press Secretary Sarah Sanders only answered reporter’s questions in the press briefing room 13 times during all of June, July and August, totally a combined 3 hours and 58 minutes in running time. ABC also reports that Sanders held fewer briefings and spent less time fielding questions in the briefing room than during the summer of 2017 and during the summers time period in the last two presidencies. Several anonymous officials indicated to Politico that Spicer will no longer be expected to do a daily, on-camera briefing after Trump’s first foreign trip. One senior White House official told Politico that deputy press secretary Sarah Huckabee Sanders may govern future briefings, and Spicer will retain a behind the scenes role in the administration. Politico also reported that another official predicated a general decrease in on-camera briefings. “I am personally offended by the American news media. I think it is destructive and disgusting. It is a danger to the country right now,” Gingrich said, adding that the press should be banished to a nearby Starbucks and that Spicer should take questions from the American people. “Just say to the American people, you get to choose,” Gingrich said. 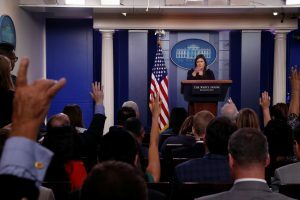 And on May 14, WHCA President Jeff Mason appeared on Fox News and further reiterated the importance of the daily briefings and that the WHCA would object to suspending the briefings, though he acknowledged that it was difficult to determine if the administration was seriously considering doing so. Erik Wemple, Media Critic for The Washington Post, writes on the declining press briefings and the White House Correspondents Association’s effort to increase their frequency and length. Wemple outlines the argument of many who say that the briefings are futile, but responds that the briefings are a one stop place for reporters to get on the record responses. May 12, 2017: Are White House Press Briefings Still Worthwhile? The BBC reports on what White House Press Briefings look like today, their origin and the troubled relationship between the president and the press. President William McKinley was the first president to allow press briefings. Theodore Roosevelt (who became president after McKinley’s assassination) created the first designated office for White House correspondents, but the first president to appoint a press secretary was Herbert Hoover, in 1929. In 1961, President John F. Kennedy delivered the first televised press conferences, a practice that is now the feature of almost all presidential news conferences. And the official White House Press Briefing Room got going in the late 1960s according to the White House Historical Association. But it is really the advent and acceptance of social media that has changed the presidency? Obama tweeted more than 30,000 times. The Atlantic article asks “what if Obama was too good at social media?” Ryan Lizza writes in the New Yorker that Obama’s eight years “have been marked by an escalating cat-and-mouse game between a communications staff that has constantly sought new ways to directly communicate with the public and a corps of White House reporters who see the efforts as a manipulative attempt to limit their access.” Although Obama claimed his administration would be the most transparent in history, many feel he did not live up to that promise. His administration’s relationship to the press was fractured, and openly hostile, at times—whether aggressively prosecuting government officials under the Espionage Act or tamping down on leaks. Under President Trump, the social media explosion continues. A Harvard Business Review article says that much can be learned from the “tweeter-in-chief about trying to win over large segments of consumers through social media” – and it does not include using White House press briefings.